Some spiritual beliefs carry this idea one step farther and define the purpose or meaning of the animal based on its specific breed and/or color as well. For instance, not all birds are the same. A Hawk will bring different strengths to your path than that of a Hummingbird as an example. These animal spirit guides help to show us the way along our own path by teaching us a little about ourselves and who we are. 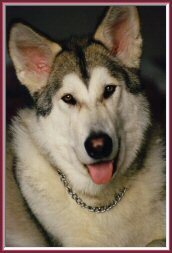 For instance the wolf is primarily a pack animal and the sense of family is very important to its nature. They’re also great communicators, howling to ensure they’re still within distance of their pack, or to find members who are not in view, as an alert for danger or even just to sing for enjoyment of it. In many native American traditions, the wolf is considered to be the highest spiritual teacher in the kingdom, even above the hawk and eagle. Keep in mind that not all Native Nations are the same. There are different views and perspectives. Tribes in the northern plains highlight the importance of the Buffalo for instance, where as those of the north east see the Eagles as holding the greater importance. Additionally each color of the wolf brings a different lesson or knowledge. You can read about these meanings in the Spiritual Classifications of the wolf. A female wolf is a creature of community. She’s rarely alone. She shares responsibilities of family with her pack. She is loyal to a fault, some she-wolves have died trying to save one of their own pack members from danger when she could have run away and saved herself. So being loyal to a fault isn’t necessarily good, but it ain’t that bad either. 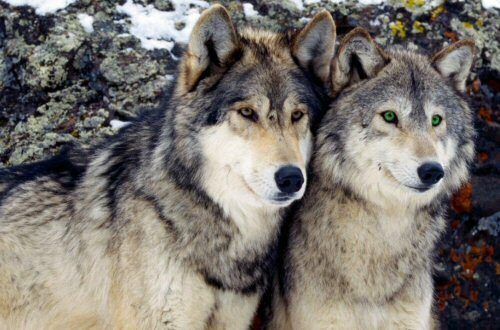 Male wolves are more likely to be loners. They’re often run off from the pack when the Alpha-Male sees the younger male as a threat to his leadership of the pack. The lone wolves will travel on their own until they can find a pack where they can challenge the resident Alpha and take over the pack. Often times, a lone wolf will find a large pack and with little effort attract one or more females who simply run away with him before her own pack takes notice. A wolf is a very territorial creature and not afraid of fighting for their home or pack. It’s not a matter of ego, but rather survival. The pack stakes out enough territory to provide for all members. The larger the pack, the more territory is needed to feed their members. Like many dogs they are wary of those they doesn’t know or trust. They will join forces with their Alphas and present a united front in defending their territory It’s an act of protection, not possession. And in typical wolf fashion, each member is on guard to sense the slightest changes in energy for good or bad. When not threatened and when treated with respect, a wolf will allow others to get close to their pack. But when approached with deceit, or hidden agendas, they will often pick up on that scent and be wary of the contact. It’s moments like this that make wolves unpredictable and often dangerous. 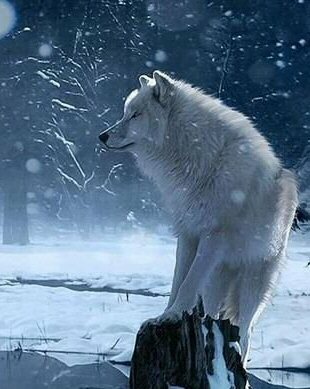 Often this “feeling” will appear much earlier than a wolf might hear or see the danger. Their instincts are highly acute. They have good ears for listening to the most intricate sounds, up close and far off. Their sense of smell is often even more acute and they may smell danger long before it’s heard. Those who have a wolf as their guide, will often know you’ve been coming to cross their path long before you arrived. So how does this “nature” of the wolf help you when a wolf is your spiritual guide? Well, it tells you a lot about yourself and how you deal with issues in your daily life. Those of us with a Wolf guide are often around others who are like-minded. That doesn’t mean we only associate with others who believe in magik or practice yoga, or see the world the way we do. Rather we’re drawn to others who look at the world similar to the way we do. Who are equally loyal, protective of family and have a sense communication and adventure. In the work place and relationships our territorial nature comes out. We work on a project and after a significant amount of effort, we can get upset when someone crosses a line and tries to take it from us or infringes on our part of the pond. Others don’t often understand our passion and loyalty to something we’ve put a lot of work and effort into. When this trait comes out in a relationship, it’s often mis-interpreted as obsessiveness. When actuality it’s more often a sense of danger or foreboding. If you have issues with separation anxiety because of a childhood event, it can translate as an adult into abandonment issues. We want to protect our mate and family, but we also want to be part of the pack. It’s scary when we face the prospect of being a lone wolf. If you keep aware of these potential issues, you can prepare yourself with supports to combat the negative consequences. Find supports that help you through the challenges of those times/events and you can lessen the impact on those around you who might feel offended or worried about your reactions. Now take these same conceptual examples and apply it to your spiritual pursuit and the events on your daily path. How often do these traits expose themselves, through good or bad results? The wolf walks beside us to help us remember the lessons we’re here to learn. Over protection can mean one needs to learn how to trust others. Territorial issues are lessons of letting go. But the positives are there too. The wolf tries to show us our innate ability to “sense” and to “hear” spiritual undercurrents surrounding events and see the present lessons. To understand that we’re not all alone and we have many “family” members to rely on. So when you’re in a state of distress, call upon your animal guide for assistance. Ask the Wolf for strength and courage. They can help you to see the nature of an issue from spirit so that you can learn why it’s occurring and how to proceed. If you don’t know what your animal guide is, you can find out. The best way is through meditation. Don’t expect to sit down if you’ve never meditated before and suddenly meet your animal guide. As with anything worth knowing, it’s worth doing. It takes a little time and practice to be able to go within and learn about yourself. If you want to read more about the Wolf and it’s nature as a Spiritual Guide, I recommend the books Animal Speak and Animal Wise by Ted Andrews.